My two Buff Brahma bantam hens started setting weeks ago. Long past when I could reasonably expect chicks to hatch (average of 21 days), both hens were still broody and I left the eggs under them in the hopes that they would still be setting when the Icelandic chicks were expected to arrive. To my surprise, three chicks were actually hatched although only one survived. The hens came off the remaining eggs a couple of days after the surviving chick was hatched. I removed the remaining eggs and hauled them out to the front pasture, far from the coop and animal pens, to be left for the wildlife. Since I no longer had expectations that the bantams would raise the additional chicks, I cleaned up the brooder and prepared it for the expected Icelandics (which didn’t arrive and may not come this season after all). Then, unexpectedly, the bantam chick died about a week after hatching. In the meantime, two of my young full-size hens had gone broody and were sitting on eggs. One, an Australorp, was in an upper nesting box while the other, a Buff Orpington, was in a lower box. I went out a few days ago and heard cheeping. The Australorp was off the nest and in the main coop with a small little black chick. 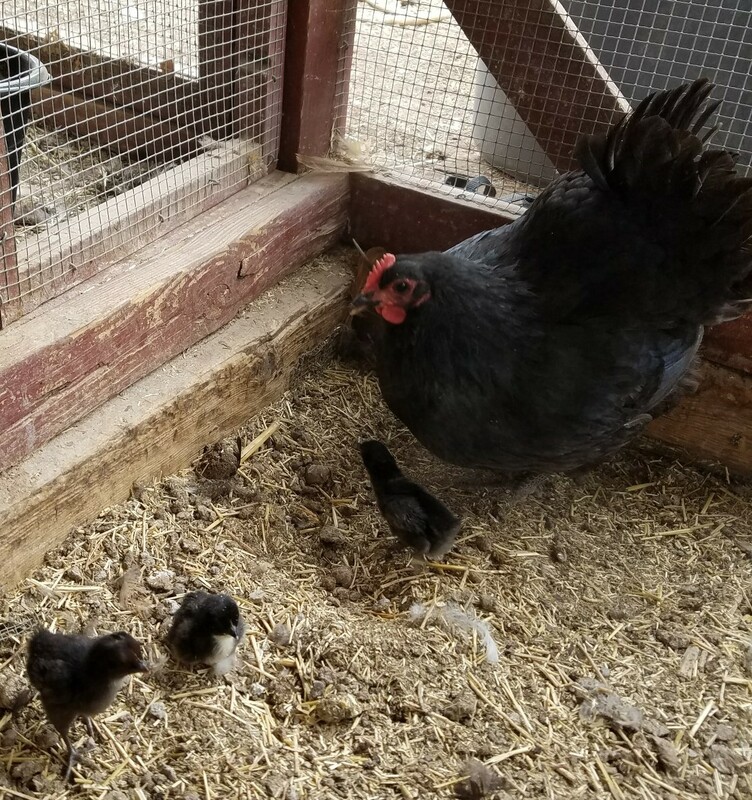 When I set up a dog house in another section of the coop and moved the hen, I discovered a second little black chick under her. I transferred a few eggs into the dog house on the off chance she would continue to set and proceeded to put the remaining 38 eggs in a bucket in anticipation of hauling them out to the front pasture. I decided to leave the bucket and eggs in the coop overnight and see if the Orpington was still setting the next day as she had been sporadically coming off the nest. She was off the nest in the morning and again in the evening so I proceeded to collect her eggs as well. All told the hens were sitting on a combined 86 eggs. However, when I removed the bucket from the coop I was hearing cheeping that didn’t appear to be coming from the section where the one hen and her two chicks were safely ensconced. As I carried the bucket down the drive I continued to hear cheeping so instead of just throwing the eggs out, I picked up each egg out of the bucket and placed it in the brush pile where I toss old eggs. At the very bottom of the bucket I found an egg that was cracked and when I picked it up I heard very clear and loud cheeping. I carefully peeled the egg open and found a bedraggled chick. Not expecting it to actually live, I carried it back to the coop and put it in with the hen and other two chicks. I was very pleasantly surprised this morning when I went out to the coop and saw three chicks running around. This entry was tagged Chickens, Eggs, Poultry. Bookmark the permalink. I had chickens for several years before I finally had a hen go broody. Most breeds – even the heritage ones – have been bred away from becoming broody as they stop laying during that time. My biggest problem is that on the few occasions a hen has sat on a clutch, it has generally done so out of the coop and chicks don’t live long “in the wild” where I live. Unless I can raise the chicks in the safety of the coop/enclosure, I rarely manage to have one live long. Many years ago, I had a Rio Grande wild turkey hen sit on a clutch of chicken eggs and successfully hatch all of the eggs. However, I lost her to a coyote though she managed to get all the chicks to safety. Yesterday morning when I went out to feed, I discovered that another chick had hatched from the ten eggs I had put in the dog house. I may have been a little too fast to assume none of the other eggs were going to hatch when I disposed of them. Note to self: even if 21 days is supposed to be the time frame to hatch eggs, it is possible to get eggs hatching well outside of that time frame.